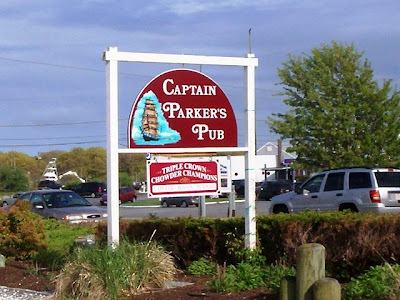 Although I had never heard of Captain Parker's before, Mom was well aware that they were triple crown chowder champions of Cape Cod, Boston, and Newport. I found this out because she started yelling, "Wow! Captain Parker's! I always wondered where that was!" as we passed the restaurant during a botched visit to the new Collucci Brothers location (we couldn't find the place, and neither could the GPS). Frustrated and starving, we decided (actually my stomach decided for us) to visit the famous Captain Parker's. When we pulled into the already busy parking lot at 5 p.m., I cringed at the amount of space each car was given to pull into. I had a funny feeling that I was going to get blocked in later on. Wow. This place gets packed! Fortunately we arrived at a good time because we were able to be seated right away. The table we had was right in between two other tables which were quickly taken by other customers (unfortunately, due to the proximity, one of the waitress's posteriors got all up in my face when she was waiting the next table). Mom and I felt a bit stuck in place, but we were dying to eat, so we overlooked being surrounded by hungry people. Our waiter, who will remain nameless as he reminded us of an impatient gym teacher, greeted us and asked us what we would like to drink. Unfortunately, we lost him at Diet Cokes. To us, it seemed like as soon as he found out that we weren't ordering alcohol, his visits to our table were extremely short. So short that I thought he was just going to fling our orders to our table from the kitchen like Frisbees. Oh well, we're not drinkers. Sorry. After he brought out our non-alcoholic beverages and gave us a minute to peruse the lengthy menu, we placed our order. Mom chose the fried haddock dinner ($15.99), while I chose the cod fish cakes ($9.99) with a cup of their famous clam chowder ($4.99). I was informed by our waiter in a loud, booming voice that I had to order the chowder separately because none of the dinners come with a soup/salad option. Fine, but the prices were on the expensive side, so I had to alter my dinner choice so that I wouldn't be spending over $20 just on myself. I guess we'll have to return to Captain Parker's with more money. It's a sacrifice that we're willing to make. 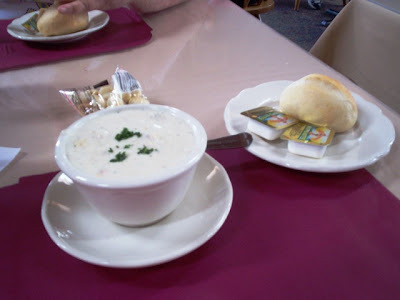 Before our meal arrived, our waiter brought over two small, warm rolls with butter and my cup of chowder. I couldn't wait to try it, so before either of us had a chance to butter our rolls (which were delicious, by the way), I grabbed my spoon and dug in. Holy crap. This was the BEST chowder I have ever had, and I'm not kidding. It was amazing. Everything (the potatoes and clams) were finely minced, I swear I recognized a hint of celery in the base, and the creamy white chowder had an excellent, savory taste. Oh my God. I could have taken home a gallon of the stuff. According to their Web site, which has the most obnoxiously loud commercial playing when you first view the page, you can have the chowder base shipped for the insanely expensive price of $43-87. Yikes! It's probably cheaper just to drive to the restaurant. With the taste being so amazing, it is no wonder why they've won so many chowder contests. It really is the best around. The dining room at Captain Parker's is really adorable. 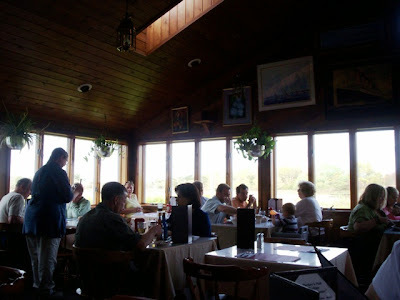 There are plenty of windows in which customers can check out West Yarmouth's quaint Parker River. There is a beautiful wooden bar at the beginning of the restaurant, a mixture of both tables and booths, and a wall of patches that seemed to go on for miles (I saw a lot of police and fireman badges). They also have a golf ball collection which I didn't see (it may have been in the bar area). The wooden walls were beautifully stained, and nautical pictures and decorations reiterated the fact that you were dining in a seafood restaurant. I would have taken more pictures, but there were too many people around to get a clear shot. 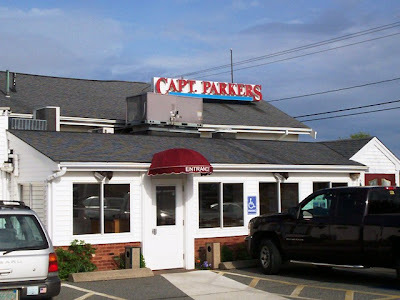 Mom was just excited to be here because she had heard so many good things about Captain Parker's. She couldn't wait until her meal arrived. Well, she didn't have to wait long before our crazy waiter tossed our plates onto our table and took off. I'll admit, he was busy. However, he could have been a little less frazzled and a little more attentive. I'm telling you - we lost him at Diet Cokes. I'm sure of it. Or perhaps he wasn't too happy about wearing shorts as his uniform. Anyway, Mom's haddock plate looked delicious. There were two pieces - a large and small one - and a good amount of thick, crispy fries. It also included a little cup of tartar sauce and a cup of cole slaw, which she gladly gave to me (and I gladly accepted). The haddock had a nice, crisp coating that was thin and didn't overpower the fish, which was beautiful, white, flaky and tender. She said that it was absolutely delicious, and not at all greasy. It was so "dry" that you could have picked it up with your hands and eaten it, but we don't do this at restaurants. Our mamas taught us right! A surprise for Mom was that she really enjoyed the fries. Usually when fries come with a meal, she eats a few and is pretty much done with them. However, the fries were so tasty that she ate the whole lot. They were thick planks that almost had the same light crust on them as the fish. They were very dry, but when you bit inside, they were creamy like mashed potatoes. 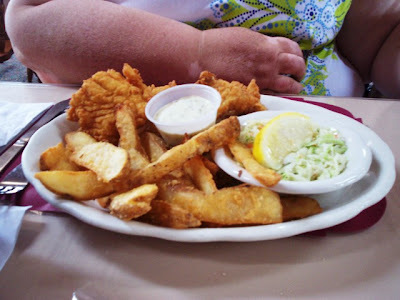 This was probably one of the best fish and chip meals that Mom has had in a while. It couldn't have been more perfect ... unless it was free. 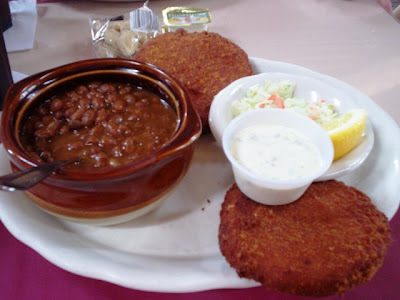 The two cod fish cakes that arrived on my plate were accompanied by a crock of baked beans, which Mom informed me was a New England tradition. Like Mom's dinner, it also came with tartar sauce and cole slaw. Each cake was deliciously crispy with a sort of mashed cod filling. In other words, there were no big pieces of fish. It had a great cod taste and reminded me of when Mom used to buy the now-extinct cod fish in a can to make homemade cakes. It was, like the chowder, absolutely excellent. You can really tell that Captain Parker's uses only the freshest ingredients. The beans and cole slaw were also very good. The beans had a very smokey taste to them, and they really did go well with the cod fish cakes. All in all, it was a perfect meal. A little pricey, but we did get our money's worth and for a fish dinner on the Cape, it was probably right on target. We left $45 on the table, which included a 20% tip for the waiter. He wasn't a bad guy, but he seemed out of place waiting tables. Perhaps he is a cop or a prison warden during the week. Either way, he did his job, and we loved every second of our meal. A job well done. 1. When there is only one or two stalls, it is impolite to stand directly in front of the restroom door. It is even more impolite to peer through the cracks to see if someone is using the stall. Whatever happened to checking for feet? 2. If you come into a restroom and see someone waiting for the stall, stand behind them. Do not crowd the actual stall area, blocking the person inside the stall from actually getting to the sink to wash their hands. 3. When someone tells you that there is a person using the stall, give them the benefit of the doubt and take their word for it. Do not push by them and insist on forcing yourself into the bathroom to see if there is in fact someone on the toilet. 4. Get away from the sink when there is someone trying to wash their hands. There is nothing worse than darting around people who are just standing around looking stupid when all you want to do is get some soap. 5. If there is no choice but to stand directly up against a person's stall door, the least you could do is stand in the center. Don't hover around the edge so that the person inside can see exactly what you're wearing. It makes the person think that if they can see you, you can see them, and that's frightening. Just back off. After our crowded bathroom experience, we headed out to the parking lot. Just as I predicted, I was stuck in a parking spot. As I was inching my way out, an elderly woman in a van stupidly tried to steal my spot - while I was still in it! I actually had to hold up my finger (no, not that one) to instruct her to wait until I was completely out of the spot. What an idiot! She could obviously see that I was having trouble getting out. Why crowd me? Ugh ... I was certainly glad to be out of that tight parking lot. Visiting Captain Parker's today had its ups and downs: up being the tremendously delicious food and cute interior, and down being all the crowding (bathrooms, parking, dining room). Mom and I will absolutely visit Captain Parker's again, but we're going to try it on an off day. However, with summer right around the corner, we doubt that they'll be any more off days in the near future. Either way, the food was so delicious that, believe it or not, I'm willing to brave the crowds one more time to have another taste of that amazing chowder. I'll just bring some aspirin and make sure I get a good parking space. 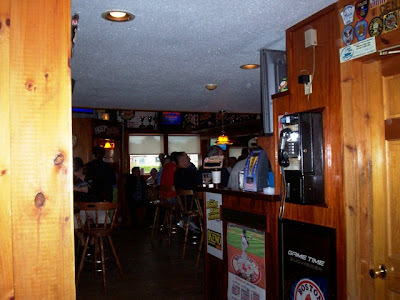 Captain Parker's Pub is open from 11 a.m. to 9 p.m. on Sunday (10 p.m. in the summer), 11:30 a.m. to 9 p.m. Monday through Thursday (10 p.m. in the summer), and 11:30 a.m. to 10 p.m. Friday and Saturday (11 p.m. in the summer). The bar closes at 1 a.m.